Two new books offer a different take on the architecture that arose after the Soviet collapse: "Mushrooms, Mutants and Others” released by Strelka Press, and "Imperial Pomp," a photo album of skyscrapers across the former USSR. For almost two decades, Mayor Yury Luzkhov ran Moscow like a feudal lord, shepherding its transformation from communist bastion to commercial hub. Along the way, he remade the urban landscape according to his eclectic tastes, which combined a love of the new with a longing for historic grandeur. Kitschy, tasteless, "the vampire style" - the words typically used to describe his architectural legacy are unanimous in their dismissal. But this month, two new books offer a different take on the architecture that arose after the Soviet collapse: "Griby, Mutanty i Drugiye" (Mushrooms, Mutants and Others) released by Strelka Press, and "Imperial Pomp," a photo album of skyscrapers across the former USSR. "I've always found [this architecture] repellent, but I sympathize with it precisely because it's so terrible," said Dasha Paramonova, author of "Griby i Mutanty." The book's title expresses two of the terms in the taxonomy Paramonova created to describe post-Soviet Moscow. "Mushrooms" are the kiosks, shopping malls, ads and markets that sprang up around the city beginning in late perestroika, when urban space could suddenly turn a profit. "Mutants" refers to the city's new luxury housing developments, expressions of the new thirst for property and prestige. A Moscow native, Paramonova is currently the director of Alexander Brodsky's architectural firm. She decided to study the buildings of her youth while taking a course at Strelka with Rem Koolhaas, the Dutch architect and theorist. "Most people thought I was just trying to being provocative," she said. "They said [this architecture] is a nightmare, and it's better to tear it down and forget about it." Paramonova sees the buildings as a record of Moscow's unique transitional period after the end of communism. As the old value system vanished, the material world was rebuilt from scratch. She identifies two main phases: the years immediately after the Soviet collapse, when individualism replaced collective values and society's id ran wild, and the period after the sobering 1998 crisis, when the country sought a return to stability and order. According to Paramonova, "unikaty," or "unique items," proclaimed the arrival of capitalist self-interest. They could be a playful expression of the customer's whims, like the yellow apartment building at Patriarch's Ponds, or the red Egg House on Ulitsa Mashkova. They could be ultra-modern and sleek, like the glass and geometry of Moskva City. In the most literal manifestation of overcoming the past, modernist new structures could be added to older buildings such as the Architects' Union, in which hulking green glass and cooper appear to devour the unsuspecting classical structure below. Within this self-cannibalizing search for values, nothing was fixed. While sleek high-rises gestured toward Wall Street, other projects looked back to the Russian empire. This usually meant replacing preexisting landmarks with modern fantasy versions. The 16th-century estate Tsaritsyno became a historic Disneyland full of gushing fountains; a resurrected Christ the Savior Cathedral gained bronze, fake marble and subterranean car washes. It was this quirkiness that first attracted photographer Frank Herfort, the creator of "Imperial Pomp" (available through Amazon or www.imperial-pomp.com). After moving to Moscow in 2006, he couldn't stop noticing the buildings around him. "It's strange architecture, of course, but very funny and playful, like a Lego house," he said. He began by photographing Aliye Parusa, the wildly colorful luxury housing development for Moscow's nouveau riche. As his work took him across the former USSR, he noticed that major provincial cities boasted their own gleaming new projects, often thanks to oil, gas and banking. The Ladya residential complex in Samara, with its disproportionate size and flying-saucer tops, feels like a southerly variation of Aliye Parusa, while the sleek shapes of the Port Baku skyscraper in Azerbaijan, or the Platinum Arena in Khabarovsk, belong to the serious, more muted style of Moskva City. What happened in the capital "can be used as a model for any region of the country," Paramonova said. "Some regions are probably even more radical than what I describe, because the greater lack of control in other parts of the country can lead to even more surprising, contradictory results." Most of the buildings Herfort captured were constructed over the last 10 to 15 years, when Moscow was becoming more conservative. In farther-flung areas, however, the diverse "unikaty" style was only beginning to take off. The most exuberant structures belong to Kazakhstan, where oil money brought an explosion of statement projects. In Norman Foster's futuristic dreamscape of government buildings in Astana, two gleaming cylindrical forms flank a golden orb suspended atop spindly white legs. For all the images' wonder, they also record the problematic sides of post-Soviet architecture. In a time of gleeful individualism, most developers gave little thought to infrastructure and integration into the surrounding environment. 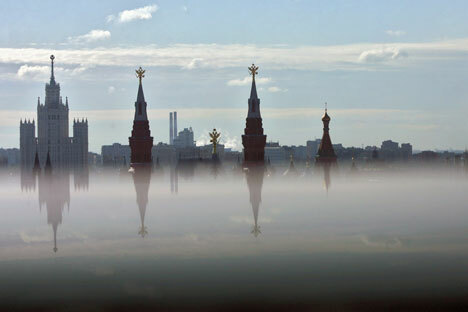 As a result, the buildings "stand like islands in the Russian landscape," Herfort said. At the foot of Samara's gleaming Crystal Palace skyscraper, crumbling wooden houses stand next to a dirt-caked Lada and a woman dropping off a trash bag by a grayish snow drift. In the shadows of the Chelyabinsk City Tower, a pair of men squat by a self-made fire, drinking. People live parallel to these buildings, not in harmony with them. In the construction rush, many buildings were made using cheap synthetic materials, which quickly betray their quality. In "Imperial Pomp," a set of four luxury apartment buildings at Khodynskoye Pole still appear in their original shade of pink. After several years, however, they have already mutated into grayish white. Paramonova suggests that much of the Luzkhov era's architectural output won't survive another half-century - an exaggeration, perhaps, but not much of one. Soon, cities will have to decide how to care for those buildings that falter, and whether to care for them at all. After the 2008 recession, the country's architectural boom has stabilized, producing mainstream buildings that would be just as at home in Shanghai as in Moscow. But the products of Russia's chaotic rebirth have their charms. "That kind of extremism in architecture, you like it because it shows some emotion," Paramonova said. "Describing nice, quality buildings just isn't interesting."